Garage door openers are made from a collection of components that can all malfunction after years of use or if they have been installed incorrectly. For example, during the winter the battery in an opener can be impacted by changes in temperature, leading to a delay in response time. The motor can lose power or completely fail which will mean it can no longer instruct the door to move at all. If you have a particularly old device, you may be increasingly frustrated by the noise it’s making while it operates. When these issues arise, it’s necessary for you to contact a professional who will be able to go over all parts of the opener and ensure that your door is primed to provide excellent performance for years into the future. We have been offering our repair services to local customers for years and have refined our practices to ensure we bring first class service to our customers. You can count on us to provide the expertise needed to get your door back in perfect working order with safe methods, efficient time frames and quality parts that are designed to provide stellar results. We can conduct same day service calls and repairs for customers that need their doors fixed as soon as possible. Have your door opener installed by a trained professional to ensure all functions are working flawlessly and all systems are built to last. 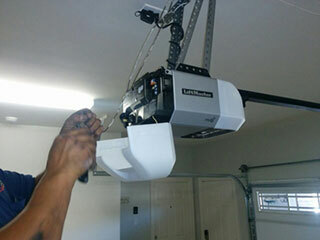 The installation process for a garage door opener can be incredibly difficult. Our team is highly experienced with all designs and modern units, so we are always prepared to get your automatic garage door working without delay or failure. Contact our team today to arrange a repair or to get more information regarding any of our products or services!